Two miles north of Santa Cruz the carcass of a strange sea monster washed up on Natural Bridges State Beach in Monterey Bay, California in 1925. 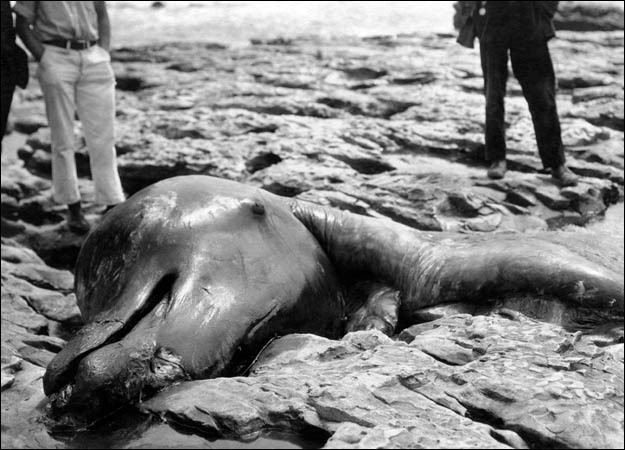 The creature was initially named “Moore’s Beach Monster” after Charles Moore who first reported it.. The neck of the monster was described as being 20-30 feet long, leading to a huge head (as big as a person) with small eyes and a duck’s beak. The smelly body had blunt “elephant-like legs” and sported a tail fluke like a whale. Some observers believed the carcass to be a whale, while others believed it to be a variety of long-necked plesiosaur or even a sea serpent. 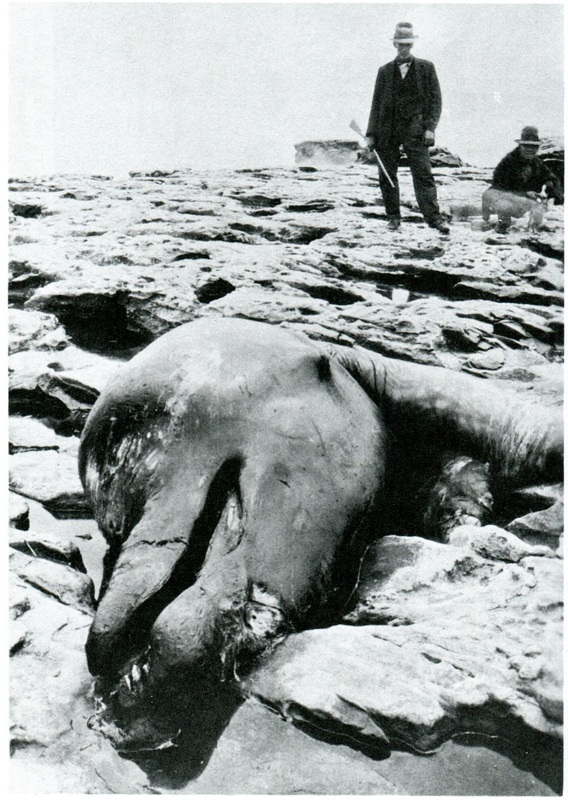 After thoroughly examining the carcass, the renowned naturalist E. L. Wallace concluded that the creature could not be a whale and might be some kind of plesiosaur that had been preserved over the eons by freezing and subsequently melting out of glacial ice. Seeking to support their sea serpent theory, several witnesses describe multiple pairs of what might have been fins or flippers, including one seen just below the head in the picture to the right. The head of the monster was eventually removed and the skull is archived at the California Academy of Sciences (see left). 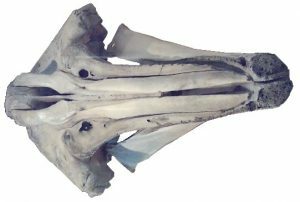 Scientists at the Academy concluded that the monster was a rare type of large beaked whale, Berardius bairdi. While the lack of teeth, bluntness of the beak, elongated neck and multiple body appendages are problematic for the whale interpretation, the skull morphology and whale-like tail are problematic for the plesiosaur interpretation. Since whales are readily observed today, we know a lot more about them than plesiosaurs. 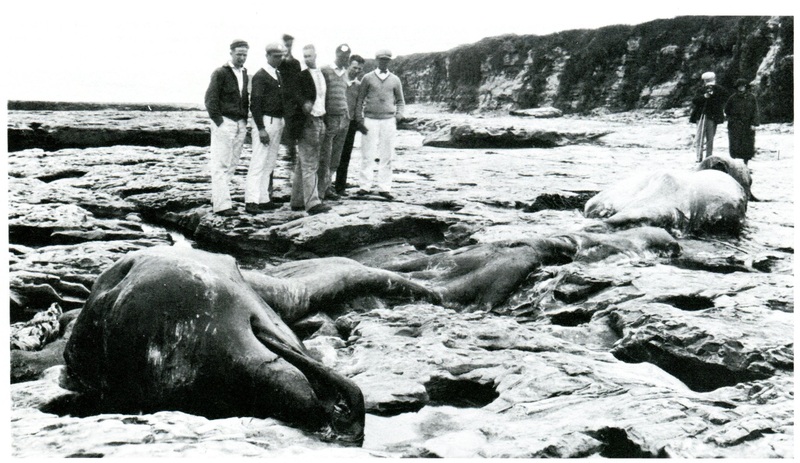 Perhaps the Monster of Santa Cruz is an animal species not yet described and known by science. The story of this sea monster and the photos to the right are from Randall Reinsted’s 1975 book entitled Shipwrecks and Sea Monsters. In one photo a cautious monster investigator is seen holding a rifle! The monster was also prominently featured in the November, 1989 issue of Skin Diver magazine which discussed the Monterey Submarine Canyon. This mysterious underwater trench extends many miles into the Pacific and is one of the least studied ocean chasms (bottom left). 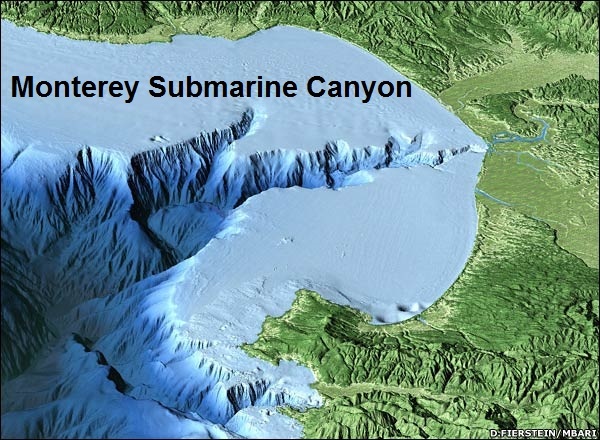 But multiple sonar readings have confirmed depths of up to 3,600 m (11,800 ft) below surface level, making it the largest submarine canyon along the coast of North America. It is comparable in size to the Grand Canyon, with canyon walls rising about a mile from the sea floor. The depth and nutrient availability (due to the regular influx of nutrient-rich sediment) makes it a perfect habitat for a rich variety of deep sea organisms.